The Lady Hornets continued the hot streak with a 5-1 non-conference game win vs. visiting Cameron on Monday night. The scoring started early when a perfectly placed free kick from Sydney Baxter found the open foot of Sarah Graves for the 1-0 lead in the 4th minute. Just 4 minutes later, Graves found the open run of Harlie Jones who placed the ball outside the stretched arms of the Cameron keeper for the quick 2-0 lead. 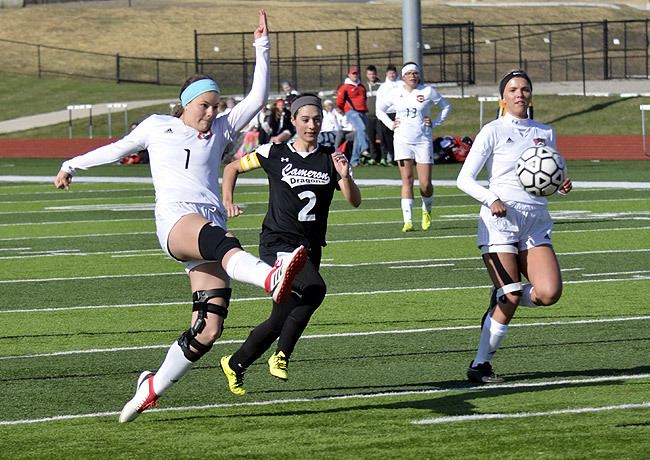 Then, just another 5 minutes later, Addie Ficken found herself open from her favorite spot on the field and lofted a high ball over the Lady Dragon keeper for the 3-0 lead just 13 minutes into the match. Cameron was able to find the back of the net when a deep diagonal was chipped over the Hornet keeper to cut the lead to 3-1. Not to be outdone, Morgan Grable was able to take the Callaway Chapman pass, beat the keeper 1 v 1 and slide the ball into the net for the 4-1 halftime lead. The game would hold steady until the 51st minute when Mykel Heese was able to thread the Cameron defense with a nice pass that found the foot of Graves. Graves was able to beat the aggressive charge from the Dragon keeper to net the final tally at 5-1. The win moves the Lady Hornets to 7-2 (1-1 MEC) on the season.